The Romani Cultural & Arts Company are once again coordinating the Gypsy, Roma & Traveller (GRT) History Month in Wales in 2012. A free event for all ages (public and schools alike) combines history and art, theatre and dance. Performances by children and adults will be designed to challenge, teach and CELEBRATE! 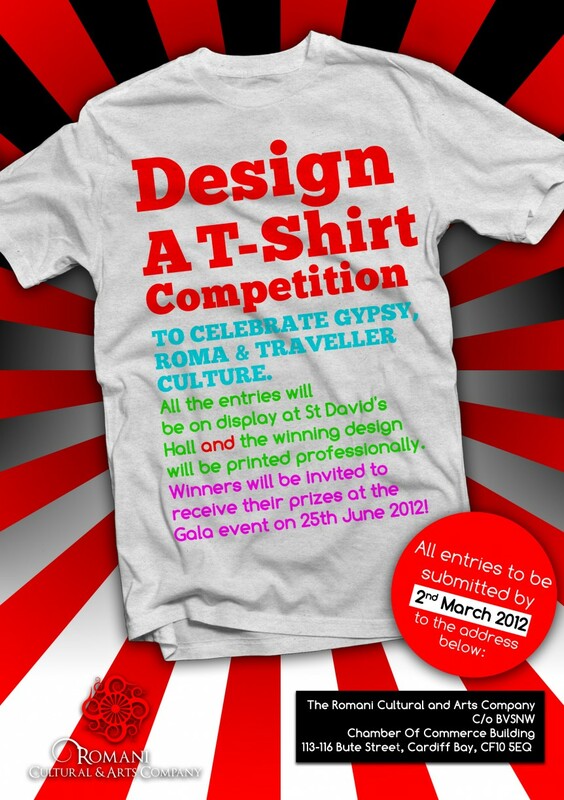 Your school has the opportunity to participate in ‘Design a T-Shirt’ competition which is open to all Primary schools in Wales to publicise the Gala event on Monday 25th June 2012, St David’s Hall in Cardiff. All the entries will be on display at St David’s Hall and the winning T-shirt design will be produced professionally and the winners will be invited to receive their prizes at the Gala event. The T-Shirt’s will be judged by Julie Morgan AM, Judith Woodman Councillor , Tim Wilson Director of the Cardiff Gypsy & Traveller Project, Delaine Le Bas International Romany Artist and Isaac Blake – Director of the Romani Cultural and Arts Company on 9th March 2012 at Ysgol Mynydd Bychan School, New Zealand Road, in Cardiff. All entries must be returned to the Romani Cultural and Arts Company office by Friday 2nd March 2012.